John Stamos is returning to television with the new comedy, GRANDFATHERED, about a bachelor who discovers he has a grown son — and a granddaughter. Fox’s take: “What’s the fastest way to put the brakes on a cruise-controlled bachelor lifestyle? Fatherhood? Guess again. 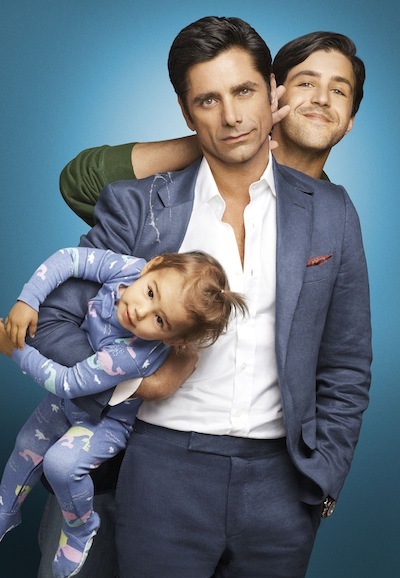 Television icon John Stamos (“Full House,” “ER”) stars in a new comedy about the ultimate bachelor who discovers he’s not only a father, but a grandfather. Successful restaurateur and man-about-town JIMMY MARTINO (Stamos) is used to being the most suave, most handsome and most single person in the room. All that changes with the surprise appearance of Jimmy’s adult son, GERALD (Josh Peck, THE MINDY PROJECT), and his baby daughter, EDIE. Now Jimmy has to unlearn a lifetime of blissful selfishness and grapple with the fact that he went straight from single to grandfather in six seconds flat. Keeping tabs on Jimmy is Gerald’s mother and Jimmy’s former girlfriend, rocker chick-turned-mother SARA (Paget Brewster, “Criminal Minds,” “Community”). Equally concerned about how Jimmy will manage these new developments is Jimmy’s restaurant family, especially assistant manager ANNELISE (Kelly Jenrette, “Audrey”) and chef KEN (Ravi Patel, “Super Fun Night”). Can Jimmy teach Gerald to be a little more like him in order to win the affection of Edie’s hot mess of a mom, VANESSA (Christina Milian, FAMILY GUY, “Baggage Claim”)? Will Jimmy and Sara fall for each other all over again, even though she’s the one thing he never dates – a woman his own age? And who’s higher maintenance, Jimmy or the baby? GRANDFATHERED is an unconventional, sophisticated comedy about coming of age – at any age. Do you think you’ll check out GRANDFATHERED?